How do medical and scientific sub-specialties relate to each other and the wider world? Integrated Veterinary Pathology was developed to provide a platform to explore this question. Click on the topics for integration tab above to see a growing list of pages that follow interconnected topics in science, medicine, education, and art, the emerging and zoonotic diseases tab for editorials, links, and materials related to the field generally and to a developing list of favorite pathogens, and the pathology tab for study materials and information within subsets of comparative pathology. Sound - on each page there is a bird call selection, and possibly other recordings in case you like background music while you read - you can click the pause button on anything that starts automatically. Communicate your thoughts and ideas: Scroll to page footers and reach me via contact forms, or leave messages on the face book page by clicking on the icon at the top of any page. 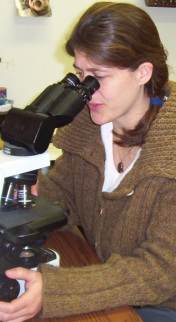 Site creator, Dr. Alexandra Brower, is an associate professor of anatomic pathology at Midwestern University School of Veterinary Medicine and she holds an adjunct appointment with the University of Wisconsin School of Veterinary Medicine. Brower is the exclusive owner of this site and the information and opinions posted here are independent of any of her affiliate institutions or groups. I have tried to acknowledge the source of any text or images that are not mine throughout this website – if you find any flaws or failures in this regard, PLEASE LET ME KNOW! If a source is not indicated, you can assume it's a Brower image, diagram, description, or commentary, aka the property of Alexandra Brower. If you want to use something that will likely be fine, but it would be great if you'd ask first via the comment forms at the bottom of each page so that I can double check permissions, and even if you don’t ask first, I hope you will acknowledge the source in whatever format you use the material in – THANKS! Small personal digressions (this is a personal website after all) that will be kept to the bottom of the pages as, in some instances, they may drag the overall quality of the content down - but you might enjoy them.